Day 3 dawned clear, cool and sunny. 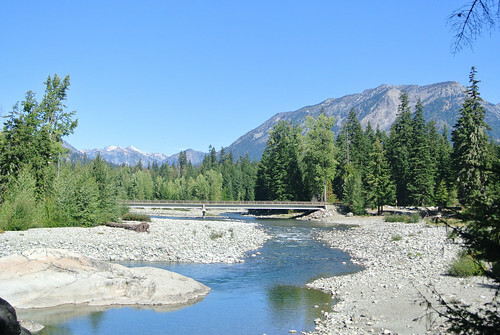 It was wonderful being in the midst of the mountains along the talkative Cle Elum River. I made breakfast and packed up and then enjoyed a second cup of coffee sitting on a rock in the river. The plan today was to ride a trail to Cooper Lake which wasn’t many miles away. There I would setup camp for a few days and hike around the area and spend time in the mountains. 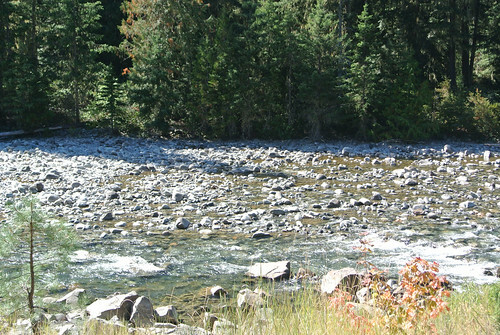 In no particular rush I meandered up the Salmon La Sac road along the Cle Elum River. Stopping frequently to take pictures, checkout trailheads and to monitor the river. Stopping at the bridge pictured above looking down into the river I spotted bright red spawning salmon! Truly a glorious time in the mountains. A bit further up the road was the Salmon La Sac Campground, which was a quite large and quite empty campground. 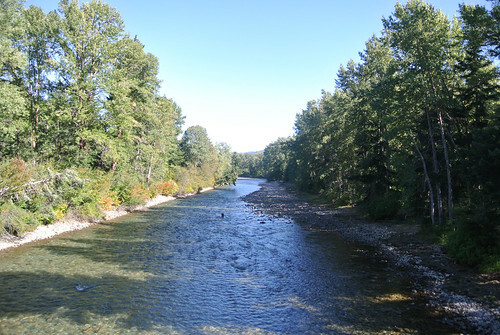 From the campground there was a short stretch on a dirt forest road before I reached the Salmon La Sac trailhead. I stopped for lunch at this point during which time a barefoot woman in a bikini walked out of the trailhead. Seemed a little casual for hiking into the mountains. However after a short stretch on the trail along the Cooper River, there was a wide bend in the river that created a deep turquoise swimming hole where there was a number of college kids sunbathing, Mystery Solved. The trail along the Cooper River to Cooper Lake was billed as a “mountain bike” trail, but it clear was a horse trail that had been opened up to mountain bikes. I assume that very technical riders with a fully suspended mountain bike and no load could navigate this trail, but it was not rideable on a fully loaded touring bicycle. Rocks, roots, short super steep sections, torn up trail and so on made for a surface that I pushed the bicycle on more than rode. After some time of this I decided that several more miles of this wouldn’t be a good time. Luckily there was an alternative route to the Owhi Campground on Cooper Lake. 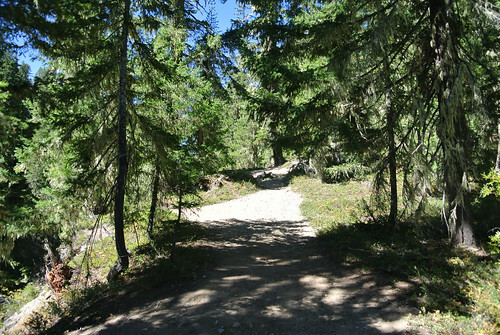 There was a forest road that took you to the south side of the lake and then you could hike around the lake to the north side where the campground is. I decided to take this, most likely less scenic, but certainly easy to negotiate route. So I rode back to Salmon La Sac Campground and then Road heading toward that bridge where I was looking at spawning salmon just few hours earlier. 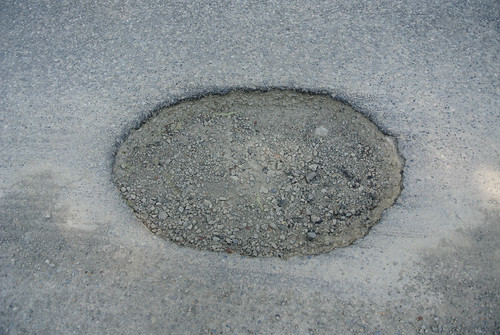 Rounding a corner on the road, gaze on the river or mountains, I glance at the road and spot the above pothole moments before my front wheel entered it. I tried to ride around it, but was two late and I dropped into it and nearly immediately slammed into the far edge. I popped out, wobbling and miraculously didn’t fall. My tire had popped of course and the wheel was way out of true. 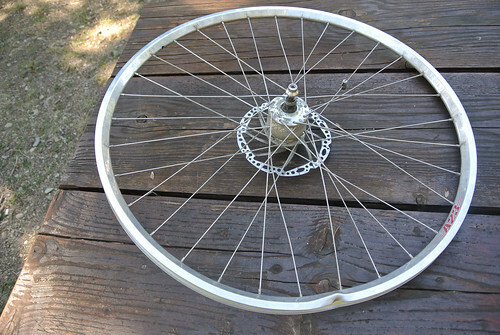 I figured I’d popped a few spokes. I pulled over and noticed how mangled the wheel was. Taking it off at a picnic table I discovered that I had completely bent the rim at the edge and this wasn’t roadside serviceable. There was a woman walking on the road right when I hit the pothole and she came over to see if I needed any help. As I pulled off the wheel and inspected the damage I allowed as I did. Her husband was off riding trails on a trials bike (something I was completely unaware of) and she said that after he came back they would haul me into Rosyln which had a bicycle shop. If it was unfixable she offered to take me back to Seattle when the left the next day. Really generous and friendly I gladly accepted her offer. As we waited, we walked down to the Little Salmon La Sac River which was shallow and rocky at this point. 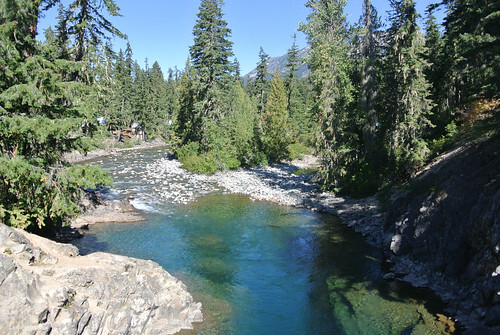 This would turn out to be my last encounter with the rivers and mountains in the Winatchee-Okanogon National Forest. Back from the trails, Julie’s husband made some attempts to pound out the dent (but just look at how severe it is) and failing that we loaded my bicycle into their van and drove into Roslyn. They walked around the town while I took it into the NW Bicycle Improvement bicycle shop. Nice helpful guy there but as I suspected they didn’t have a viable replacement rim in stock. So I was prepared to return to the campground and stay overnight and return with Julie and her husband tomorrow. But while I was in the shop they talked it out and decided to just haul me back right away, cutting short their weekend camping. That was super generous and of course while I said I’d be happy to return the next day, I gladly accepted. So back into the van with the bicycle and now it was a reverse trip down I-90 back home. I had them drop me off near the Bellevue Transit Center where I was able to take a bus home. So this is the first tour I’ve been on that got cut short due to mechanical issues. I’ve had many mechanicals on tour and have fixed most of them in situ, for at least long enough where I could get professional help. But this was unfixable by anyone on the road. While I was lucky with there being people willing to help immediately on had I have to say at no point was I worried or scared. To me handling the unexpected is part of what you are training for in each tour. Just up the road from the accident was the camp host for one of the campgrounds and I knew I could get a ride into Roslyn from them. From Roslyn I could either wait out a replacement wheel, or work out a bus back to Seattle. So while there definitely would be some much less fun effort involved I never felt that I was stuck. Too me the biggest downer was that my mountain camping was cut short right at the point I was really interested it: hiking in the Alpine lake regions. Well I know for sure that I will be back! I awoke to a clear, cool morning in the midst of the Cascade Mountains. After making breakfast and breaking down camp I discovered that the outhouse at the Cold Creek Campground was locked. This didn’t bode well. 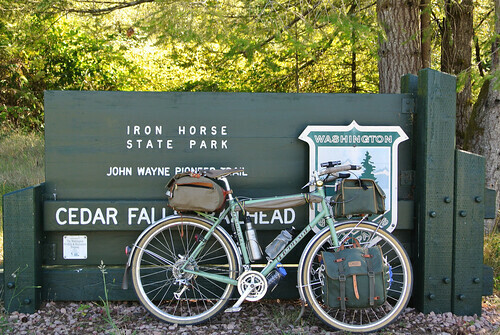 I wasn’t too far from the Hyak Trailhead so I rode back up there to use the facilities. While there my rear tire went flat. This was not a great shock as the rear tire was quite worn with at least one hole in it which had led to this flat. I patched the tube, booted the tire and ended up having lunch at Hyak. So it was after noon before I was back on the trail heading east. 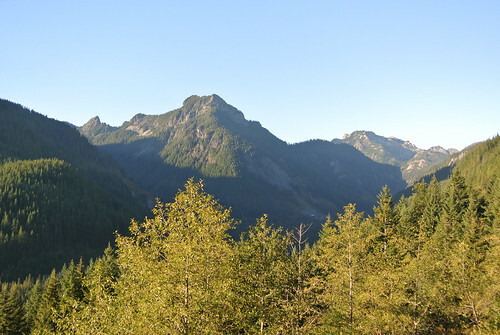 Just past Snoqualmie Pass you are in the midst of the Cascades on a high plateau surrounded by mountains. There are a number of reservoirs up here which feed Seattle and other Western Washington cities. 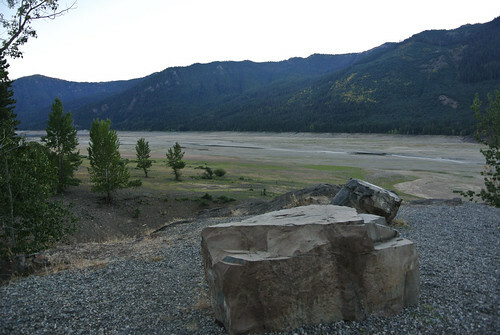 So for several miles the trail winds around Keechelus Lake and is quite level. The east side of the mountains is dryer, but up this high, it isn’t a drastic change. The underbrush thins out, things are less green, there are more pines than firs and so on. As one travels further and further east the flora changes a lot more dramatically. The valley opens up and there are dry, brown grassland, sparse stands of pines and much less shrubbery. 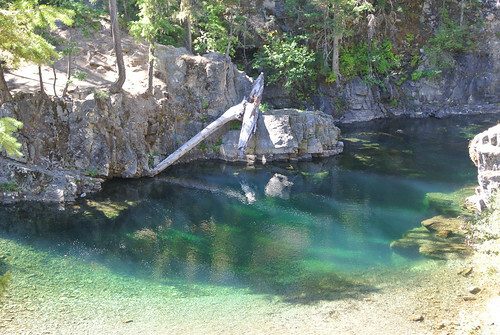 In contrast to the tans, browns and yellows is the deep blue of Lake Easton, the turquoise of the Yakima River and as I left the trail, the rocky green Cle Elum River. 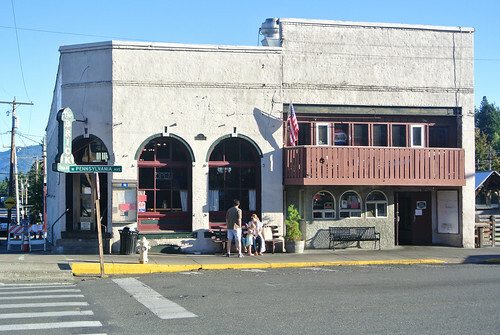 I left the trail and headed north toward the small town of Roslyn. Best known as the setting of Cicely, Alaska in the TV show Northern Exposure, the town has had a recent resurgence as a hub for mountain recreation. Getting there by bicycle was pretty straightforward though there was a nice stiff climb up the valley wall. These are all roads that aren’t designed to accommodate bicycles but generally there were good shoulders. Due to my late start I arrived in town around dinnertime and finding the Roslyn Brewery closed I settled on The Brick Saloon. It was taco night at The Brick, which I didn’t indulge I did partake of a Roslyn Brewery Pale Lager which sure helped wash away forty kilometers of trail dust. 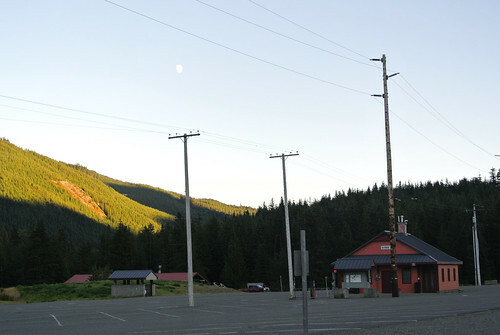 The sun was low in the sky once I left Roslyn and rode out to Cle Elum Lake. There are campground all around the northern end of the lake (the boundary of the Alpine Lakes wilderness) and I basically planned to just ride until it was near dark. The road along the lake was all ups and downs and until I entered the Wenatchee National Forest it was pretty dense with upscale “cabins”. It was pretty deep gloaming by the time I reached Red Mountain Campground and it was a few more miles to the next ‘ground, so I deemed it prudent to stop for the night. There was only one other group of campers on a Tuesday night in Mid-September. A group of college age kids they were definitely having a good time. I camped as far away from them as the ‘ground allowed and only heard the occasional exuberant shout. But it cools right down once the sun is gone and soon enough all of us were in our respective domiciles. In 2016 I undertook three tours, the last of which end abruptly. This is the tale of that tour. 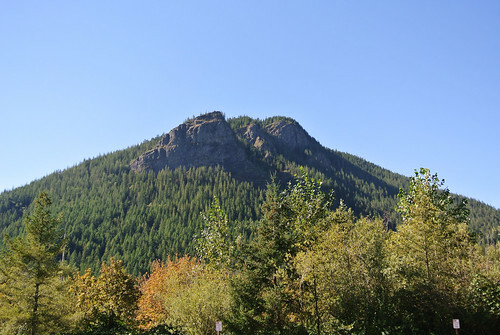 My plan was to take the bus up to North Bend and then ride to the Iron Horse Trail which I would then take nearly to Cle Elum. 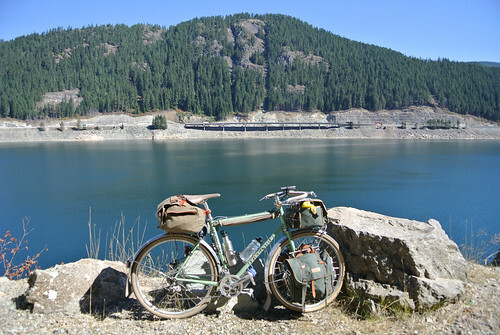 From there I’d ride to Roslyn, Cle Elum Lake and then to a campground on the very edge of the Alpine Lakes region. There I would camp for several days and hike toward The Enchantments. Finally I’d make my way back. I also thought if it looked good, that do the Stampede/Tacoma Pass loop off of the Iron Horse Trail. So this was going to be a mixed-terrain, bike packing, hiking adventure in the Alpine Lakes Wilderness region of the Cascades. I left Beacon Hill in Seattle September 12th for a week long jaunt before 9am. A good start! I rode a couple of kilometers to a bus stop on I-90 where I caught Sound Transit 554 to Issaquah. Unfortuently I was too late to make the connection for King County Metro 208 up to North Bend. As that bus only runs every two hours (!) I decided to ride up to it’s last stop before entering I-90 and meet it there. So I rode through Issaquah and onto the Issaquah-Preston Trail. Absolutely glorious day, with a pure blue sky, and the sun filtering through the trees. Being mid-September it was comfortably warm but not hot. Looking to be a great week in the mountains. I made it to High Point where that bus stop was with still more than an hour till the bus would arrive. Oddly there was a car fully in the ditch in the freeway underpass. I decided that I would give up on the bus and just ride on from here. I continued on the Issaquah-Preston Trail, to Preston where I then transitioned to the Preston-Snoqualmie Trail. All familiar routes so far. 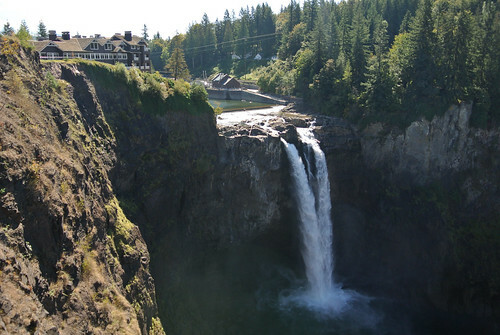 But instead of the various ways of working my way up to Snoqualmie Ridge, I instead rode down to Fall City and then up the road to Snoqualmie Falls. With all the attempts I’ve made to avoid this route with a full touring load, it turned out to really be no big deal. It’d be less fun for sure with dense tourist traffic, but on a Monday morning mid-September, not bad at all. I arrived at Snoqualmie around noon, so of course lunch was at the Snoqualmie Falls Brewery. It was pretty warm in Twin Peaks, err North Bend and I was happy to get back into the woods and make my way further up into the mountains. I was going to be riding all the way across the back and camping on the east side this night (why I wanted to bus to North Bend and cut out some riding) so there was a lot of miles on gravel ahead. The ride through the woods was quite enjoyable. The seasons are always in advance in the mountains and the signs of Autumn was everywhere. Yellow, golden and red trees stand out amidst the bountiful evergreen trees. People were out, but with it being during the workweek and school back in session, there were no crowds. Long distances on gravel wears you down, the extra resistance, the vibration in your hands, needed to hold on more firmly to the handlebars. 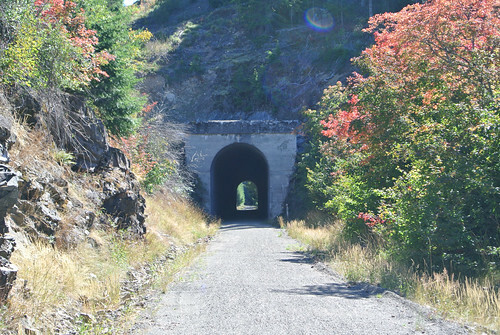 Riding the Upper Snoqualmie Trail and then the Iron Horse Trail for around forty kilometers, you definitely feel it. These trails keep to a minimal grade, around 2-3% but it does so for pretty much the whole way. That just adds to the effort required. But it is great to be in the woods, in the foothills and the Cascades. I-90 is always nearby, but you are completely out of traffic and I love it. The sun sets early in the mountains, even on the longish days of the end of summer. The shadows were getting longer as I rode through the two mile long Snoqualmie tunnel. Through the tunnel I was at the Hyak trailhead. 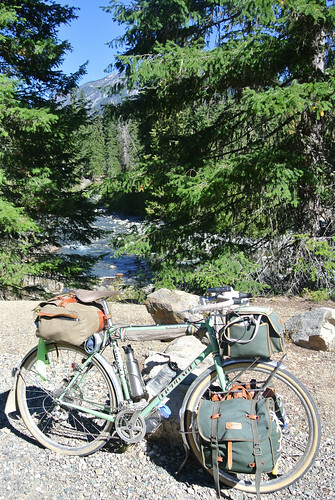 I stopped there briefly but soon rode the last few kilometers to Cold Creek Campground. There I filtered water, made dinner, setup camp and all of the other details of camping out in the woods. Soon it was dark and cold and I was happy to get into my tent in the moonlight and retire for the night.